From the Loyal Subjects comes all your favorite Masters of the Universe characters as collectible Action Vinyls! 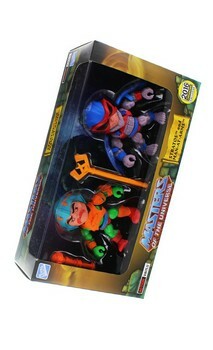 This limited edition two-pack includes Original Toy Color Variants of Stratos and Man-At- Arms! Each figure stands 3.2 inches tall. Both figures come equipped with multiple and interchangeable accessories. Packaged in a collectible window box. Collect them all! From the Loyal Subjects comes all your favorite Masters of the Universe characters as collectible Action Vinyls! Each figure stands 3.2 inches tall. Both figures come equipped with multiple and interchangeable accessories. This limited edition two-pack includes Original Toy Color Variants of Stratos and Man-At- Arms! Packaged in a collectible window box. Collect them all!